Striped Dewflower is an unbranched tufted annual herb 5-25 cm tall. Shoots are erect to rising or prostrate, rooting at the lower nodes. Leaves are narrowly lanceshaped to lanceshaped-oblong, 1-4.5 cm long, 2-6 mm wide, tip pointed, base rounded to stem-clasping, both surfaces hairless, margins rough. Flowers are born in pairs (rarely of 1, or 3 in an umbel) at the end of branches or in axils of upper leaves. Peduncle is 1-2 cm long, usually hairless. 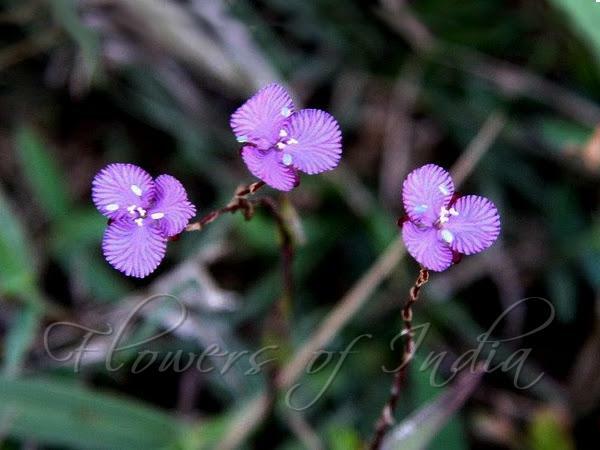 Flowers are 8-13 mm wide, with 3 round petals, pale lavender with dark, contrasting veins. Petals are 3-5.5 mm across. Flower-stalks are erect in fruit, 2-8.5 mm long. Sepals are ovate to ovate- lanceshaped, ovate-elliptic lanceshaped-elliptic, 2.5 x 1.9 mm. Stamens are 3, bending to one side of the flower, the style to the other in the bisexual flower, symmetrically arranged in the male flower. Filaments are 2-3 mm long, densely bearded below the middle with short, appressed hairs, Staminodes filaments are 1-1.5 mm long, 3, antherodes 3-lobed. Style is 1.7-2.35 mm long, mauve at least basally, stigma capitate, white. Capsules are oblong-ellipsoid, 34.5 x 1.92 mm, brown, hairless. 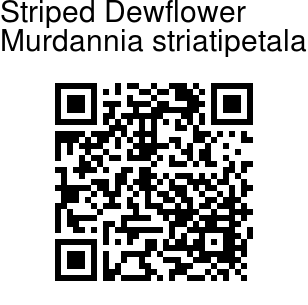 Striped Dewflower is found in northern Sri Lanka and southern India, in abandoned paddies, ditches, vicinity of waterholes, moist, seasonally swampy places. Flowering: November-March. Identification credit: Mayur Nandikar Photographed at Red Hills lake, Chennai, Tamil Nadu & near Nellore, Andhra Pradesh.